← RoboCop (2014): Part Man. Part Machine. All Boring. Aren’t second chances great? A figure you missed out on gets rereleased, retooled, redecoed or remade and… well, hopefully you can find it this time. 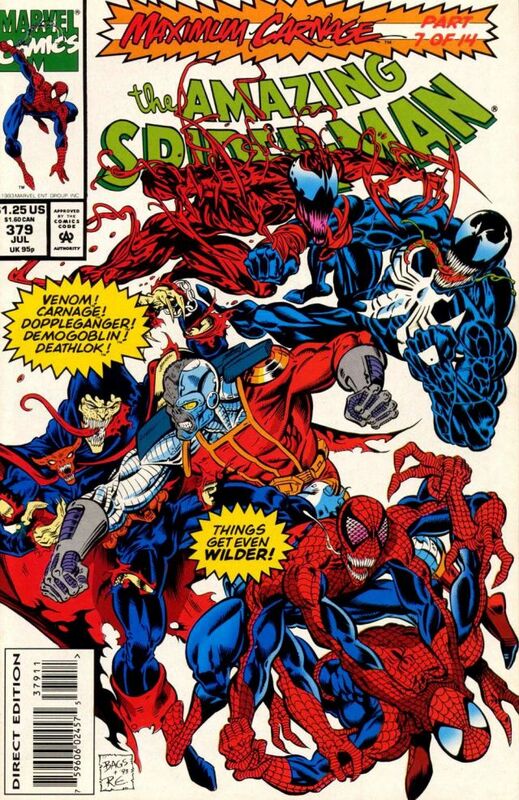 Amazing Spider-Man #379 was the first Marvel comic book I ever bought, being drawn in by Mark Bagley’s cover art. 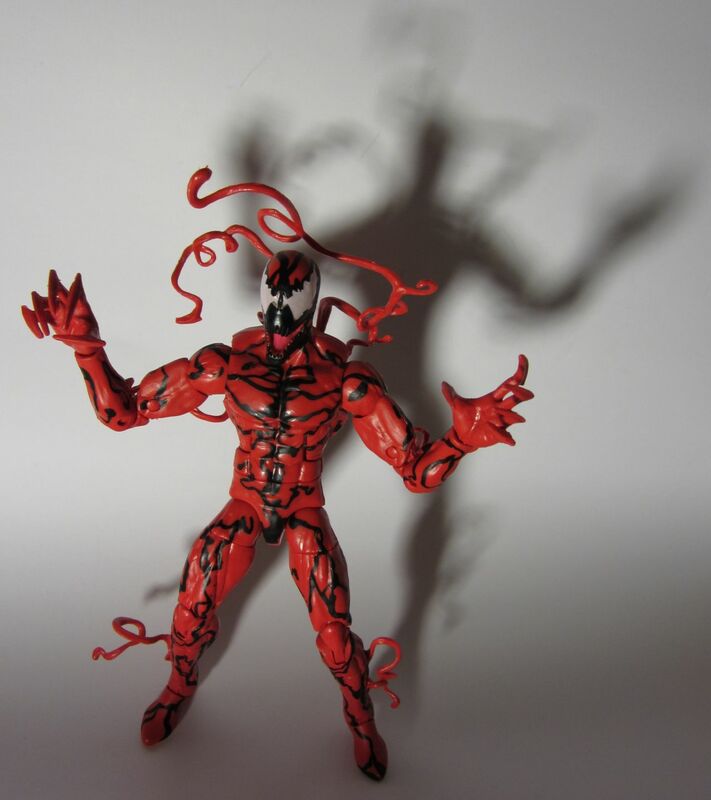 I managed to collect the rest of the Maximum Carnage series, and eventually got my hands on Carnage’s earlier appearances, so I’ve always wanted a good Carnage figure. 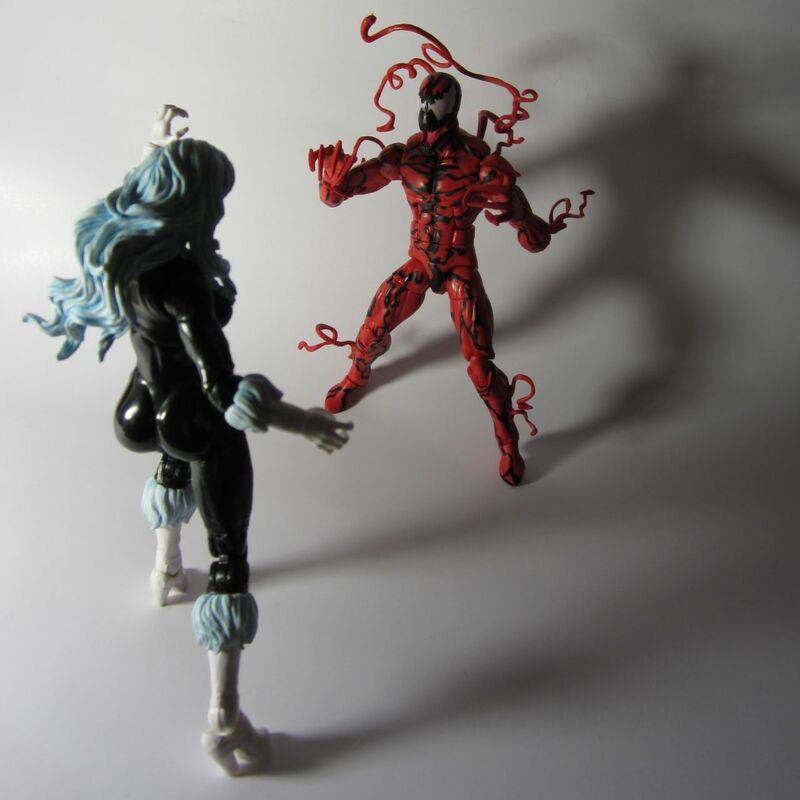 ToyBiz made a Carnage around 10 years ago for their Marvel Legends-like Spider-Man line. 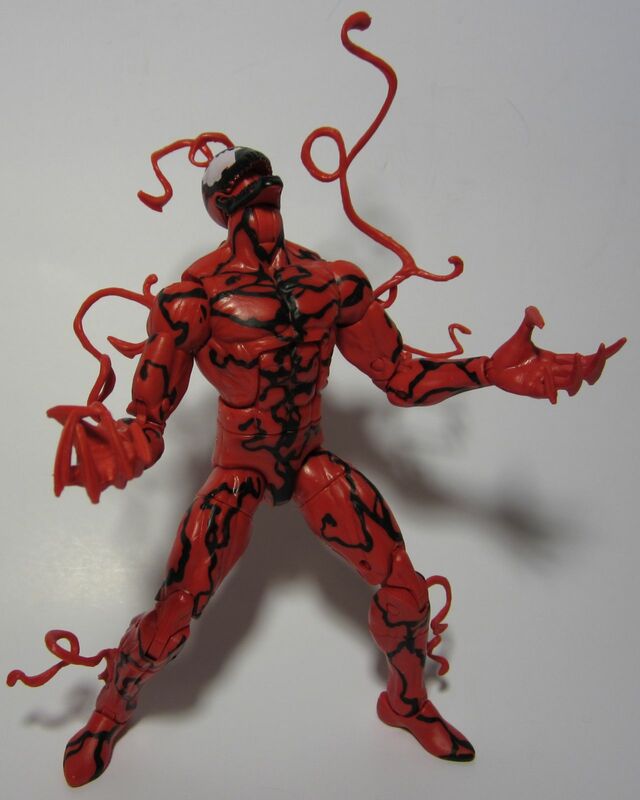 It appeared again in a Spider-Man’s Fearsome Foes box set, and again in a later Spider-Man series, with a different deco and/or head sculpt each time. So wait, I had 3 chances and I never managed to get him? 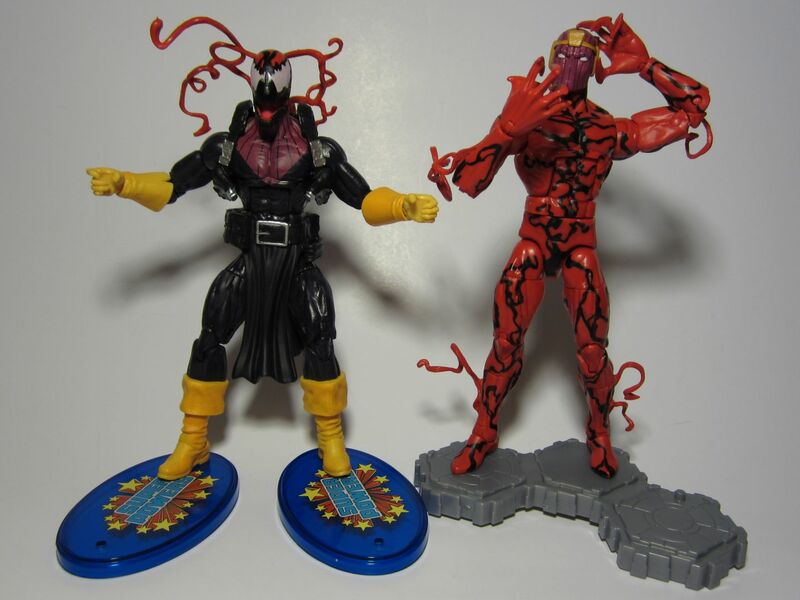 Well, whether ToyBiz or Hasbro was in charge, Marvel Legends has always had spotty distribution, and it was easy to miss original characters in those Spider-Man lines when most of what you saw on the pegs were things like Scuba Splash Spider-Man. 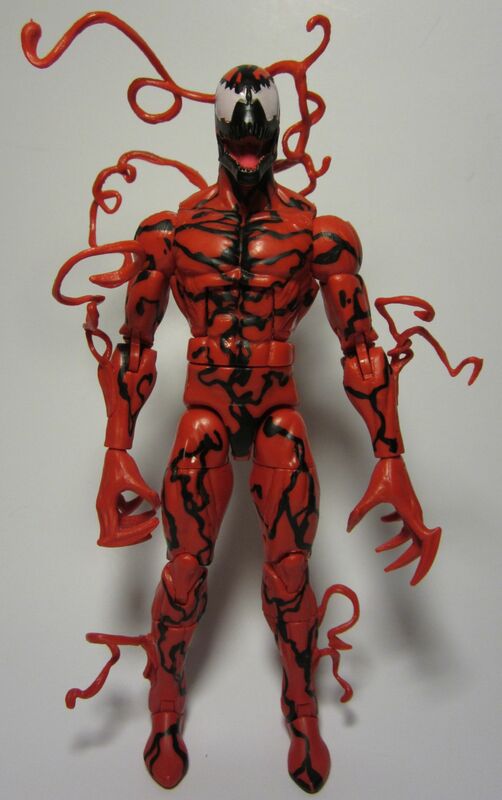 So now Hasbro has a new Carnage, and it’s the Carnage I always wanted, or close enough that I can’t complain. 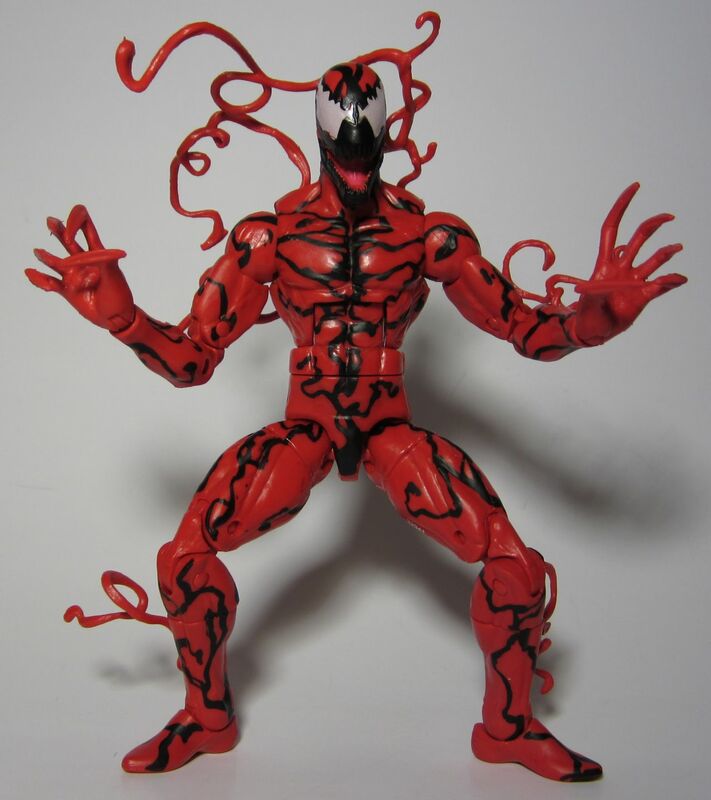 Carnage shares his core body with a few other figures, so he doesn’t have the slimy details sculpted in like the old ToyBiz figures – most of him is just a typical superhero-muscular body. 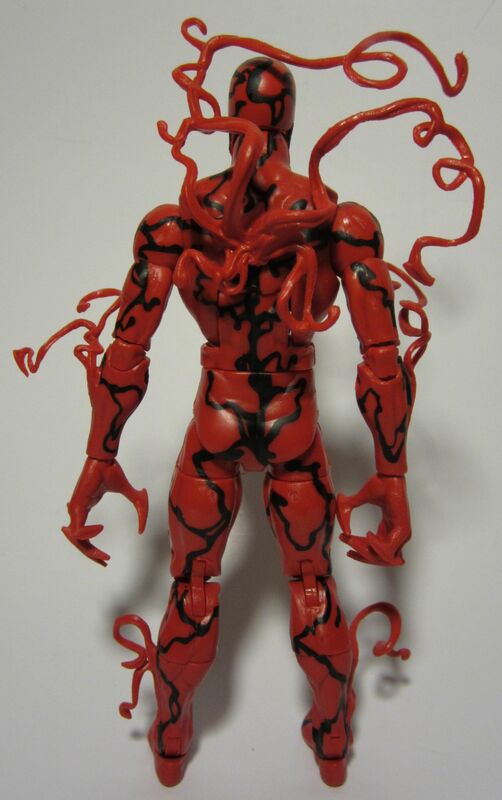 What are new are the tentacled forearms and lower legs as well as the clawed hands and of course, the head. The tentacles are nicely sculpted with lots of twists and loops, some ending in blades. He also has an elaborate bundle of tentacles that can be plugged into his back. 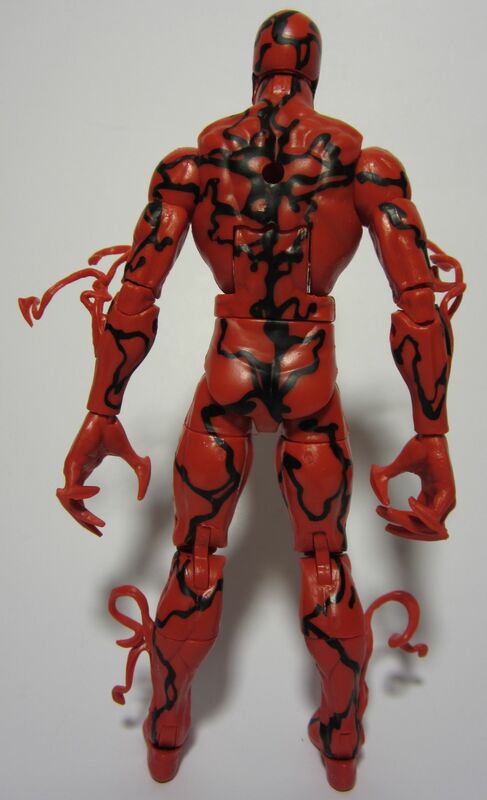 The entire figure is cast in red plastic, with his black lines painted on. There’s no shading or wash. I find some spots of paint on my figure have either chipped off or were missed at the factory, and there is even a splotch of paint on his chest where there shouldn’t be. 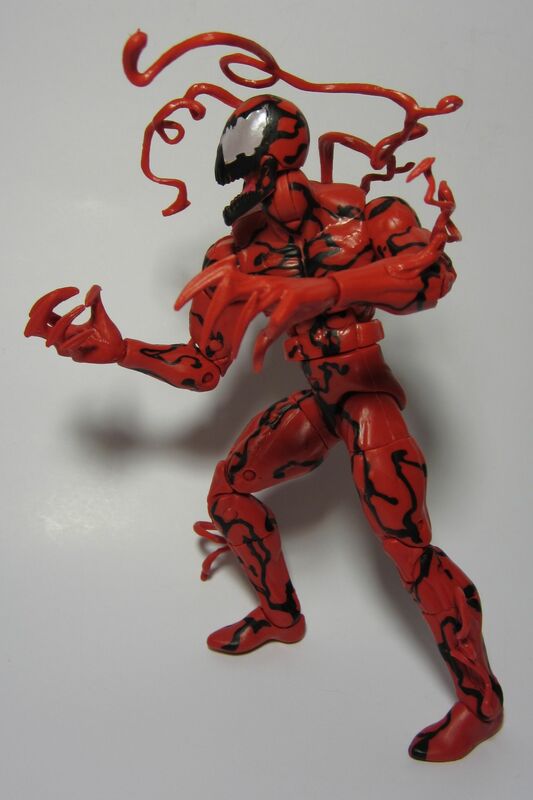 If this were any other figure that would bother me, but it blends right in with Carnage’s design so you wouldn’t notice unless you’re really trying. 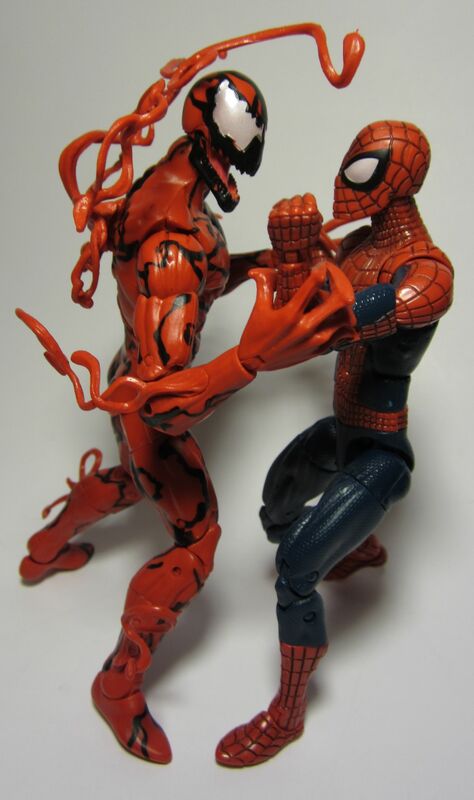 Unlike the old ToyBiz figures, the head sculpt seems to be based directly on Mark Bagley’s artwork, and it looks great. The teeth are sculpted, his large eyes are recessed a bit, and you can see a tongue or tendons in his mouth. 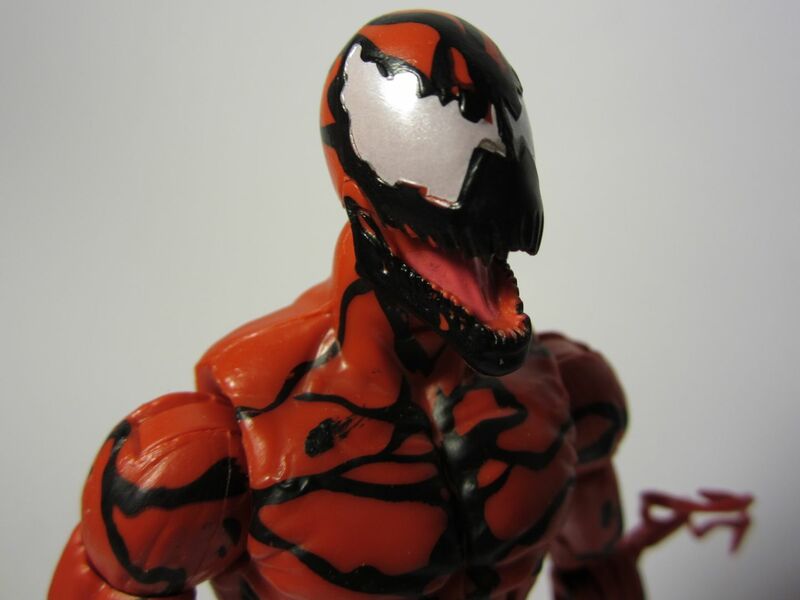 In addition to the black paint the rest of the figure has, the inside of his mouth is painted pink and the eyes are a pearlescent white. Unfortunately there is some paint bleeding around the eyes, but it’s not too bad. 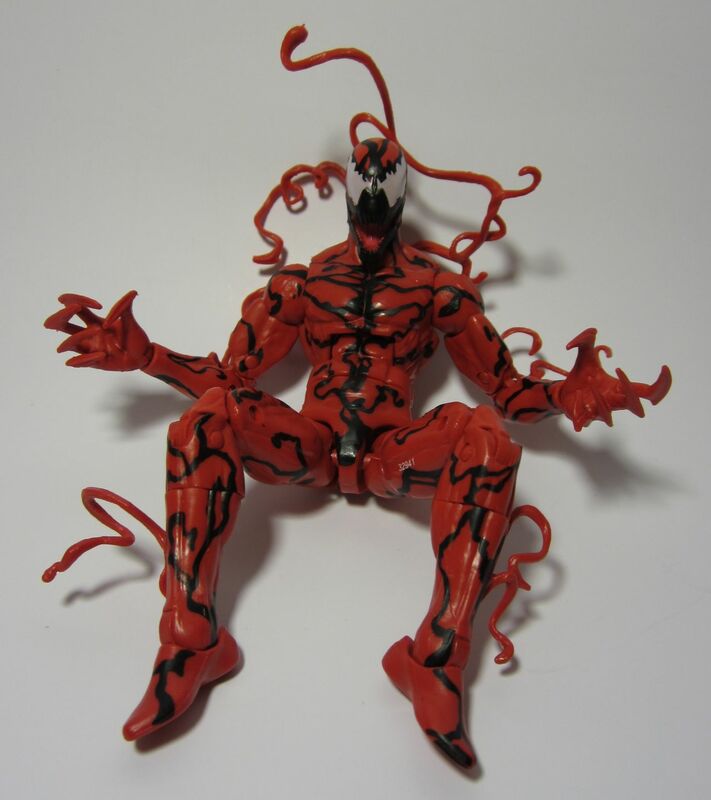 Carnage stands a little under 6 1/2″. That’s probably about average for Hasbro’s Marvel Legends, about as tall as DC Universe Classics, about half a head shorter than Masters of the Universe Classics, and taller than Star Wars Black Series. 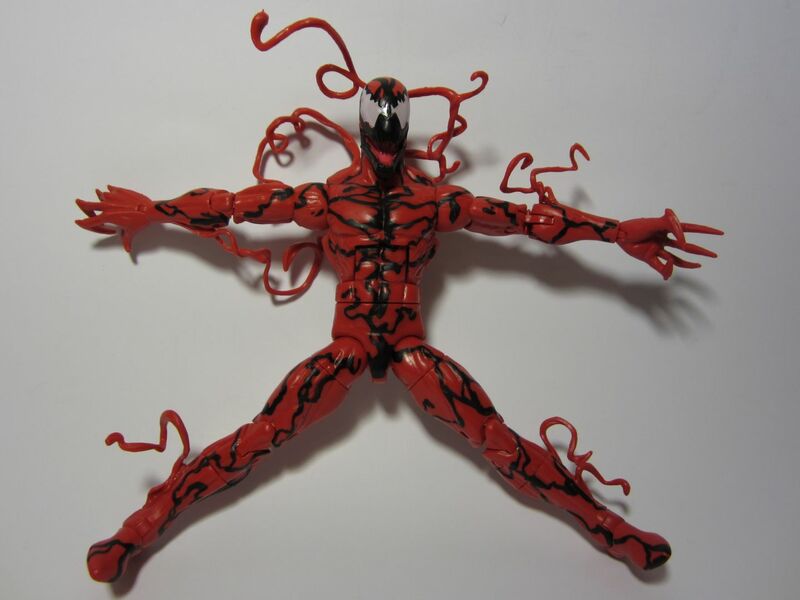 Carnage’s head is on a ball and can turn all the way around, and the neck is hinged to allow a very good range of forward and back movement. The jaw is a separate sculpted piece, but there is no jaw articulation. Shoulders are swivel-hinge, with very tight and loud ratcheting joints. There are bicep and calf swivels. Elbows and knees are double-jointed and ratcheting. He has a ratcheted ab hinge and waist swivel. The back tentacles have one specific “correct” way they fit, but you can still turn them around at the peg for more options. Wrists and ankles are swivel-hinge. The ankles are a little more loose than I’d like. They’re tight enough for most 2-foot poses, but putting all his weight on one leg is a bit too much for them. Hips are horizontally-mounted ball joints that a lot of Hasbro figures use these days, with thigh swivels. This seems to work just as well as the ball-shaped swivel-hinge hips (+ thigh swivels) that MOTUC and some Marvel Legends use, but each method breaks up the sculpt in its own way. The pelvis piece gets in the way of leg movement a little more than I’d like, but it still works pretty well. 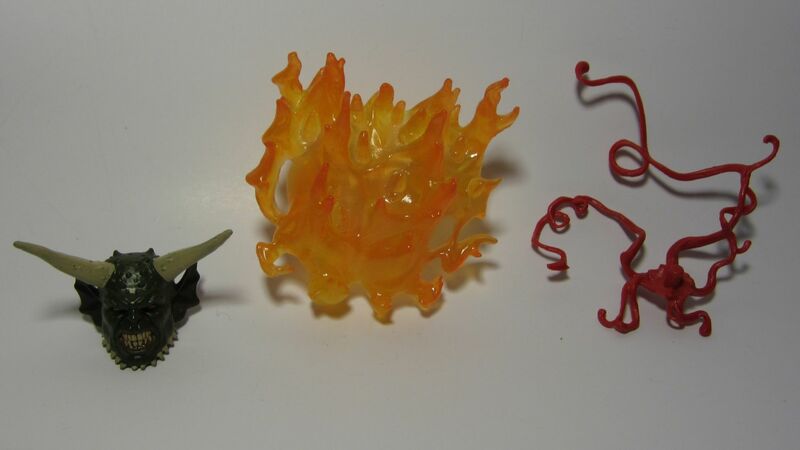 The only accessories are that removable bundle of tentacles and the Ultimate Green Goblin Build-A-Figure pieces. 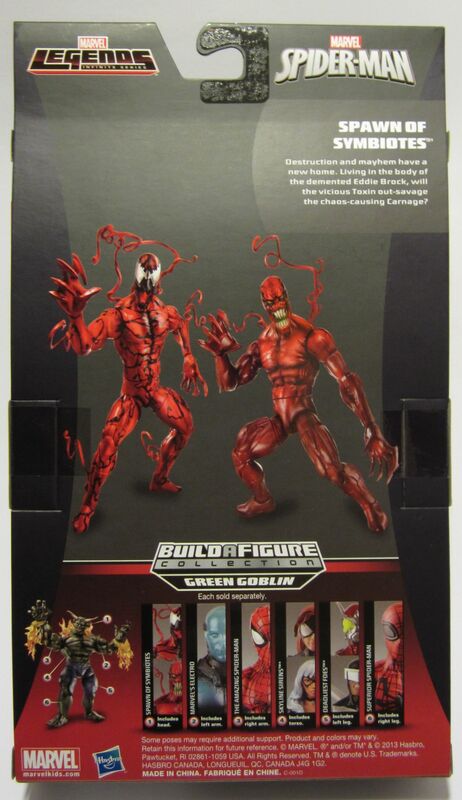 Carnage comes with the Goblin’s head and a fire effect that fits on his back. 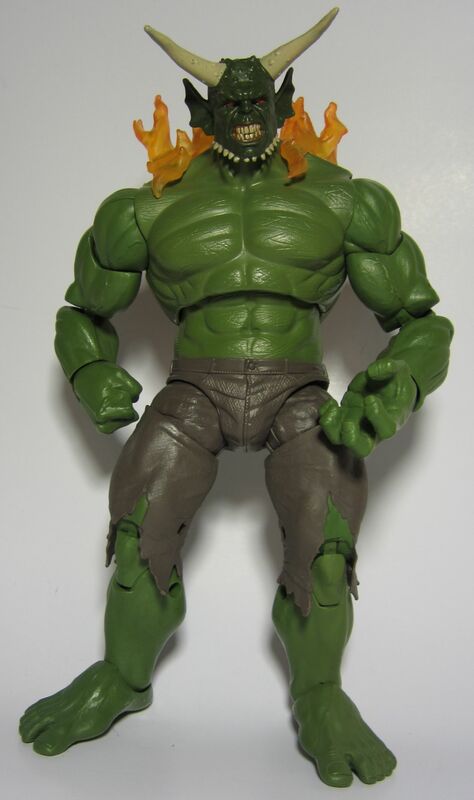 UGG shares a few parts with the Hulk from the Avengers movie line. 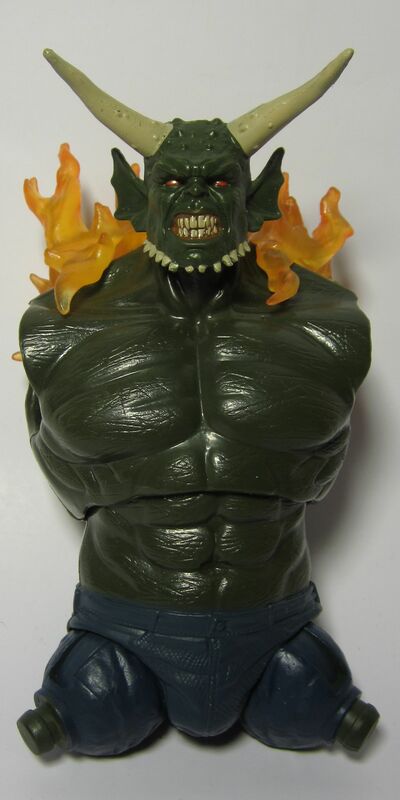 The fire effects fit on him, and you can swap their heads. 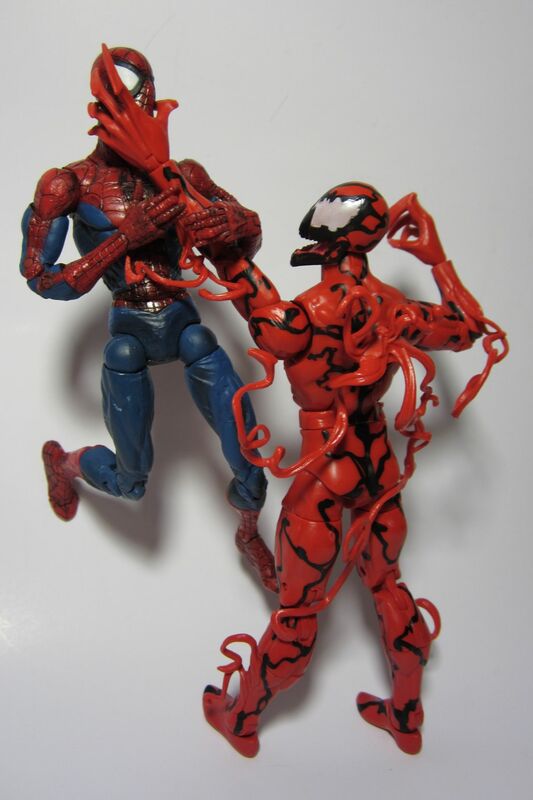 I would’ve liked some swappable hands like the two Spider-Man figures in this series. Some long blades or other creative alternative hands would be a nice addition. This might be neat if the skin colors weren’t so far off. Both feet have 3mm peg holes, so you can use the interlocking stands that came with the Avengers movie figures and some Marvel Legends, as well as Mattel’s DCUC stands. The 4mm hole in his back also fits some other things, such as shields from recent Captain America figures. 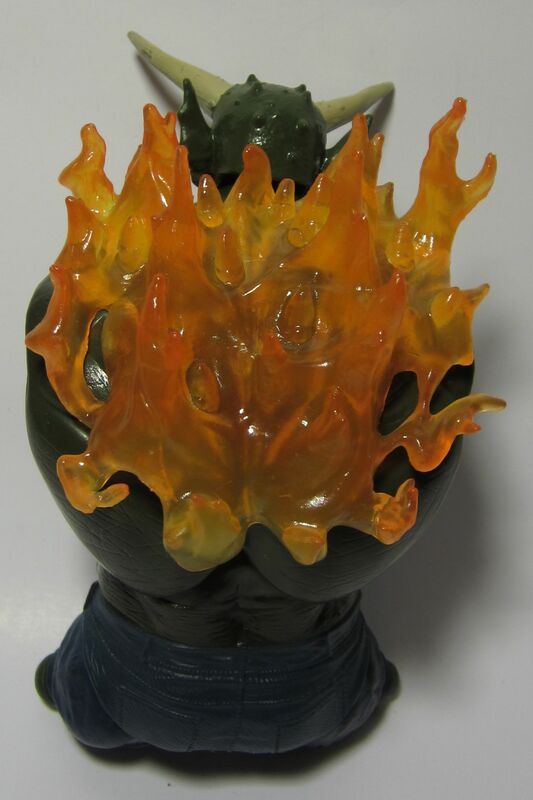 As with many of Hasbro’s recent 6″ figures, and similar to MOTUC, the head can be popped off and swapped onto other figures. 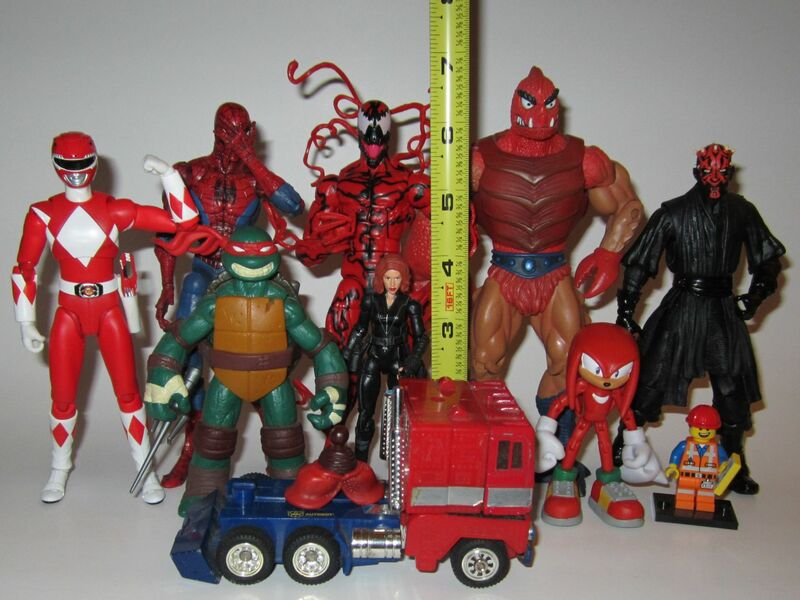 There’s not as much consistency in size as there is with MOTUC, but several Marvel Legends figures are compatible. 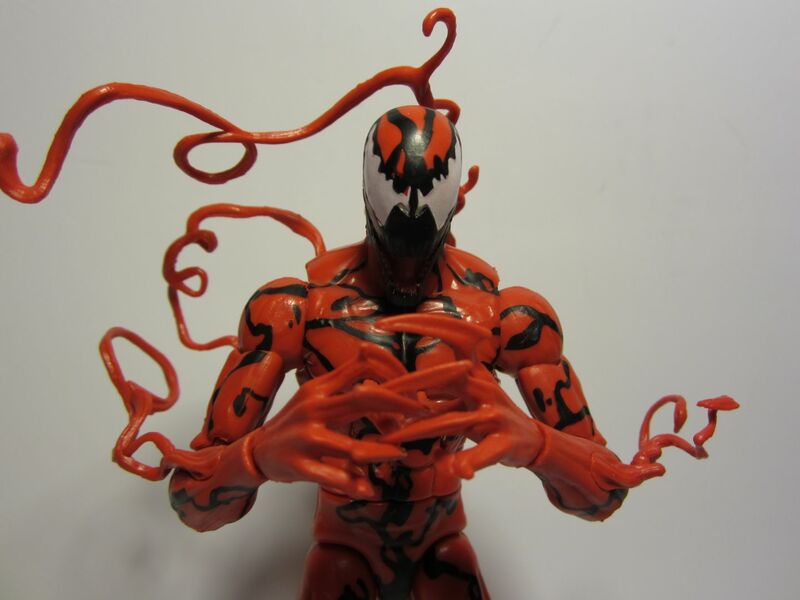 This is possibly my favorite Marvel Legends figure to date, and I definitely prefer it to the ToyBiz Carnage I never managed to get. The sculpt looks nice and the articulation allows for plenty of fun poses. 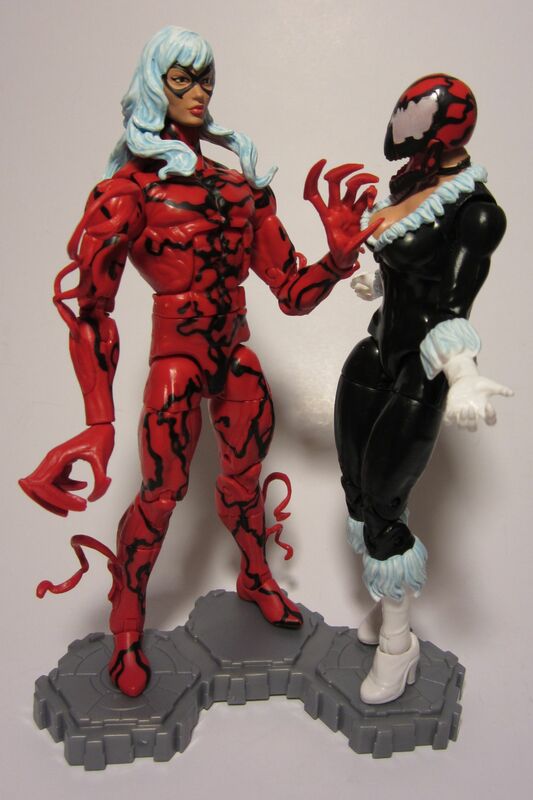 So, Hasbro, how about a Mark Bagley style Venom soon? (Or ANY Venom, come on!) 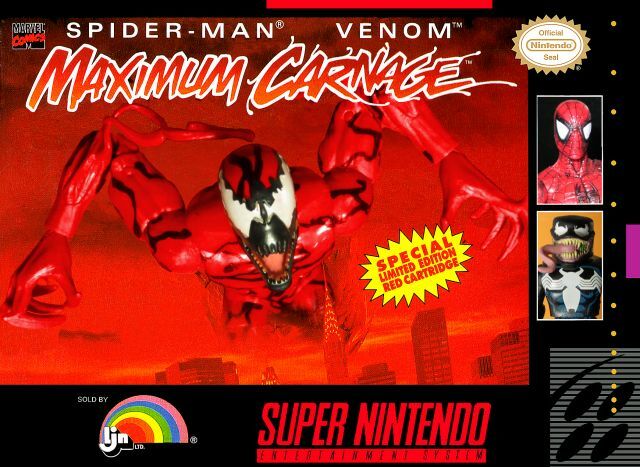 I’d like to see a few more characters from Maximum Carnage too, like the Spider Doppelganger or Firestar, but that’s just wishful thinking. If you’d like to get this figure, they should be found in all the usual places, such as Toys R Us, Target, Amazon, etc. I found mine at Kmart, and have seen this series at Walmart as well. Problem is, this figure is one per case and pretty popular, so it may be tough to find. 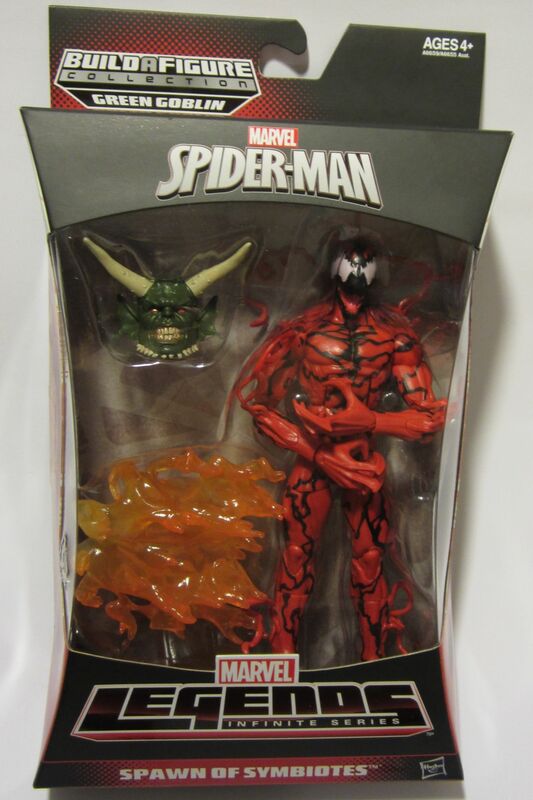 Even worse, there is a refresh case that replaces Carnage with Toxin. Good luck! A frequent visitor to flea markets and the Goodwill, I enjoy collecting video games, toys and old electronics. Other interests include cartoons, sci-fi, fantasy, and horror movies, as well as wasting far too much time online. 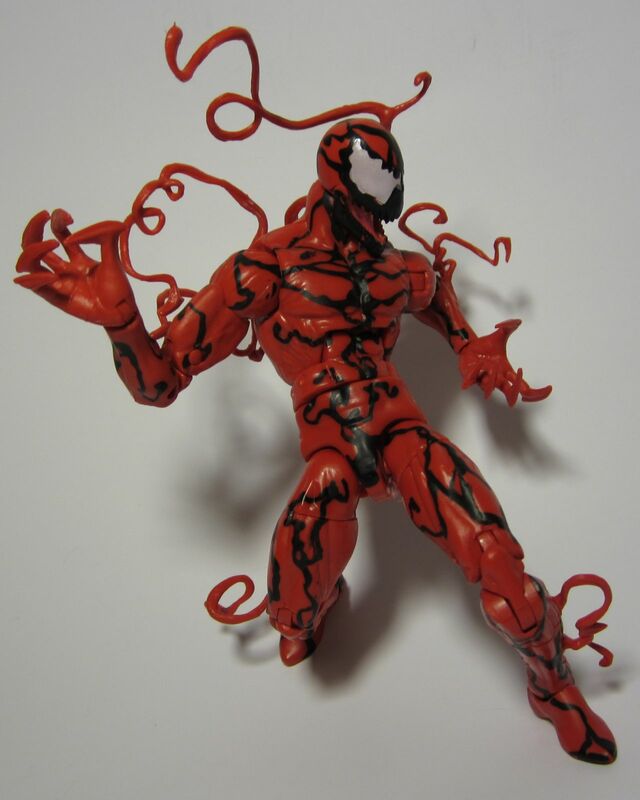 Posted on March 22, 2014, in Reviews, Toys and tagged action figures, Carnage, Cletus Kasady, comic books, Hasbro, Infinite Series, Marvel, Marvel Legends, Spawn of Symbiotes, Spider-Man, The Amazing Spider-Man 2, toys, Ultimate Green Goblin. Bookmark the permalink. 1 Comment. RoboCop (2014): Part Man. Part Machine. All Boring. Warner Archive Instant: Behold the Future of Streaming! Oh, and Despair. I find your ideas intriguing and wish to subscribe to your newsletter!